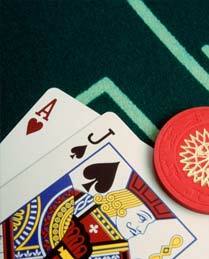 The system of progressive betting, or "parlay" is a system perfect for online blackjack games. Its techniques are the same as with a lot of other systems: you have to minimize any potential losses and get the most profit when from a winning streak. Its special feature is as follows: great results will come about when the basic strategy is used along with it. The "parlay" strategy of betting is also known as "positive" since a win should increase the bet size and a loss should decrease it. In the majority of online casinos out there, the lowest possible bet size would be $2 to $5. For convenience, bets are called "units". The initial bet usually bets two units equal to $10. So, if the player wins that hand with a blackjack, the payout stands at three units, so he will get five units in total for the win. With this system, the player needs to bet five units next and if he wins again, the next hand needs to be a ten-unit bet. Now, the player can keep betting like this until he takes a break, grabs the profit, or busts. In any case, the player needs to begin the next bet with the initial two-unit bet size. However, it would also be vital to keep in mind that winning streaks aren't endless, so players need to stop when they can and start making low bets again so they don't lose all of the money that they won.